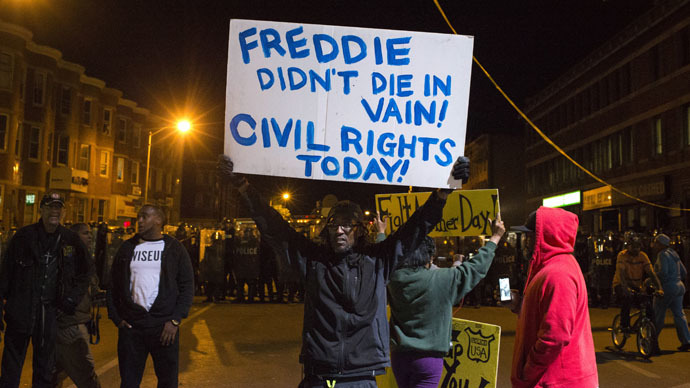 The mainstream US media are facing criticism over their coverage of unrest in Baltimore. Activists and residents claim the media ignored peaceful marches, focused on labels and violence, and ignored the chronic issues of poverty and police misconduct. Protesters shouted down Fox News’ Geraldo Rivera, who arrived in Baltimore shortly before the curfew on Tuesday. They blocked his camera and accused Fox News of lying and “false coverage.” Maryland state legislator Catherine Pugh helped extract the angry and flustered Rivera from the crowd. Fox and other networks were accused of ignoring the peaceful marches and gatherings that were previously protesting the death of Baltimore resident Freddie Gray in police custody. Gray’s spine was severed under unexplained circumstances and he passed away earlier this month. Fox News host Shepard Smith, speaking on “The Five,” also pointed out that the media has ignored Baltimore’s chronic issues, including the Gray affair. Ferguson community organizer Deray McKesson called out CNN host Wolf Blitzer for pushing him to denounce violence. McKesson said that the real perpetrators of violence had been the police around the US, who have killed over 300 people just this year. McKesson also criticized city officials for calling black people “thugs.” Baltimore Mayor Stephanie Rawlings-Blake was the first to use the term, describing the rioters as such at a press conference on Monday evening. She later tried to walk it back. City Councilman Carl Stokes was exasperated by CNN host Erin Burnett’s use of the word. Meanwhile, Baltimore teachers and students complained to Mother Jones magazine that the official story about a planned “purge” was a fabrication. Baltimore police deployed officers in riot gear at the Mondawmin Mall in northwestern Baltimore on Monday afternoon, claiming that social media chatter was calling for a riot inspired by “The Purge,” a 2013 film about a world where all laws are suspended for a day. With the major transportation hub for high school students closed, hundreds of teens were stranded at Mondawmin and, at some point, clashes with the police began. However, no evidence of social media posts calling for a “purge” has ever been produced. Odd. With all the references for a so-call "purge" on in Baltimore that not one media source has produced a shred of supporting evidence.